What is the relevance of early eye development genes for mature retinal function? Eye development is an astoundingly precise process in which the activities of a large number of genes have to be coordinated. Many of the participating genes have been defined through genetic studies in human eye malformations, such as absence of eyes (anophthalmia), small eyes (microphthalmia) no iris (aniridia) and gaps in the retina (coloboma). Several of the genes identified in this way have turned out to produce proteins (transcription factors) which regulate the expression of other genes by binding to DNA. In our lab we have identified three major genes, SOX2, OTX2 and PAX6, which are at the top of the hierarchy controlling eye development. Exploring the function of such human disease genes generally has to take place in animal model systems, since access to human tissues is difficult. This has been a particularly feasible approach for such developmental regulator genes because they have turned out to be very highly conserved during evolution, so that their protein sequence and their roles in eye development have been strongly maintained all the way from fruit flies to mammals. We and others have been able to study the detailed function of these genes in models such as chick, fish, frogs and the faithful standard laboratory mammal, the mouse. Precise manipulation of gene expression is possible in the mouse, so gene function can be analyzed in detail at different stages of development and ageing. Such studies revealed that genes like SOX2, OTX2, and PAX6 fulfil multiple tasks in several cell types and at different stages of eye development and often in other organs too, mostly in the brain. Surprisingly they also continue to be expressed in the adult eye. SOX2 also plays a major role in keeping stem cells in a fully potent state from which all the different tissues of the body can be derived, just as from a fertilized embryo. At the next stage of development, all nerve cells also need to express SOX2 and PAX6 the next gene to be turned on. So perhaps these two genes are required for all stem cell functions? Only in the last few years have we realized that adult tissues contain stem cells, even if we do not normally see regeneration of damaged cells in tissues like the brain and eye. It turns out that PAX6 and SOX2 are expressed in these adult tissue stem cells in the eye and the brain. 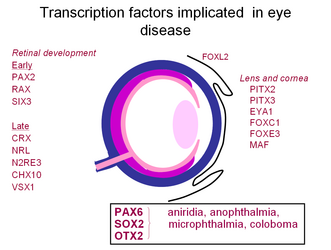 PAX6 is on in ciliary margin cells from which mature retinal cells of several types can be grown in culture throughout life. In mature retina too we find SOX2 expressing Müller cells, now accepted as adult stem cells, although we do not yet know they full regenerative capacity. However, now that we can recognize these cells, we are able to explore their full capacity for repair and regeneration. 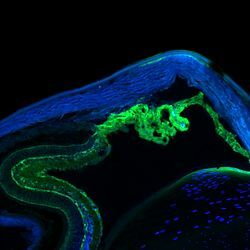 Recent studies in Paris and Japan have shown that OTX2 needs to be expressed after birth to ensure that the correct connections are made between the retina and the brain.